Brick Joints: Spacing, SIze, Variance? How big can a but joint be in face brick on wood studs? How much of a variance can there be in but joint sizes with tumbled brick? I believe I am seeing two completely different questions. one is in regard to the material that will used as the substrate in your wall assembly. You will need to contact your local building department to solve the issue of fire-treated vs non combustible plywood. As far as staples in gypsum board, that method should not be used. Adhered veneer is supported by the substrate it is applied to thru the lath and the anchors used to attach the lath. I am attaching a couple of items that will give you direction on the assembly. One item to read is ASTM C1780 Standard Practice for Installation for Adhered Manufactured Stone Masonry Veneer. Even though this Practice does not include thin brick, the substrate preparation is relatively the same. Another document is BIA Tech Note 28c for Thin Brick Veneers. It is an excellent reference document. If you know the brick and its manufacturer additional information technical information is generally available on their website. I hope this is helpful in designing and constructing a beautiful and functional thin brick. What is the "STC" rating for brick? The "STC" or Sound Transmission Class of a brick can vary based on thickness, hollow or solid, and textured finish among other things. The Masonry Society has a publication called TMS 302 Standard Method for Determining the Sound Transmission Rating for Masonry Walls. It helps calculate the STC of a wall. There is a BIA Technical Note # 5A. It describes a typical 4" brick as having a STC of 45. The best way to determine the STC of brick is to contact your local brick distributor. They should be able to give you the value of the specific brick you want to use. The attached photos show residential structures with cracking at the corners of significant openings (over 6 ft). First, is this cracking "normal" or is there a material defect? Secondly, is this a structural problem for the home? Third, what is the recommended repair? The pictures provided (see below) show cracks under the precast header bearing at what appears to be both ends of an opening. These cracks then turn and extend up to the top of the wall through the course above the precast in a stair step fashion. The third picture provided shows cracking under the end of a precast sill which then extends from the lower right hand corner of the opening down the wall in a stair step fashion. My response to this inquiry is based strictly on the three pictures provided. There may be other extenuating circumstances that I am not aware of. 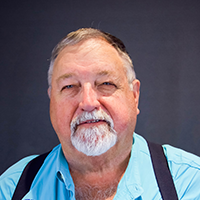 There are three important considerations to keep in mind when working with either concrete or concrete masonry - it's gray, it gets hard AND IT CRACKS. 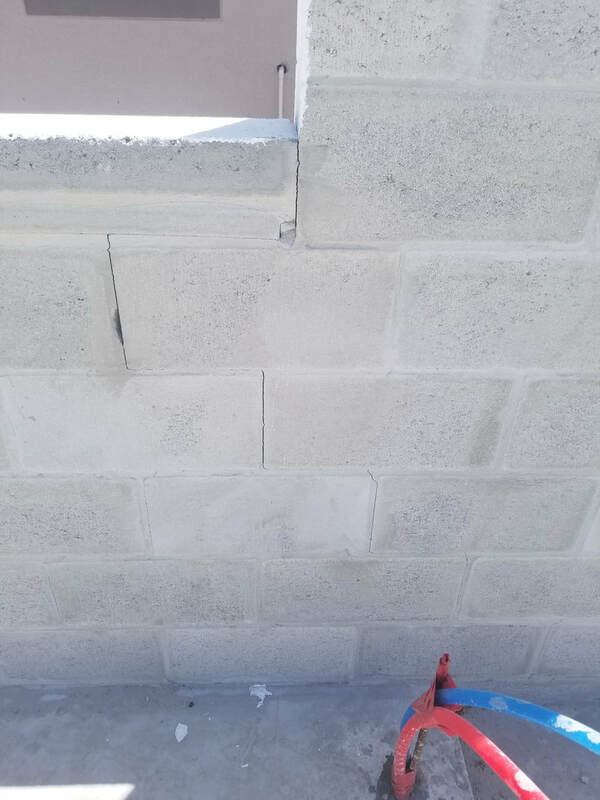 The cracking can be caused by movement (such as foundation failure), expansion and contraction due to temperature differential or drying shrinkage. Of these three, drying shrinkage is the by far and way the most common and MUST be addressed if random cracking is to be prevented. Concrete materials shrink when they loose moisture. Concrete poured under water does not shrink as long as it remains submerged. 50 years later if you pulled it out of the water and let it dry out it would shrink the normally expected amount. An exaggerated visual to keep in mind is that of a sponge drying in the sun. The normal masonry shrinkage expected from Florida aggregates is around .025% or around 0.3 inches in 100 feet. We have an odd size cell and wanted to know the max bar size we could use in that cell? The cell is 5" long and 2 1/2" wide. This is the info from the code on the size of reinforcing you can have in a cell (from current 2016 TMS 402). Looks like the max bar for Allowable Strength design for a 5" x 2 1/2" cell is a #7 and the Max bar for Strength Design is a #5. 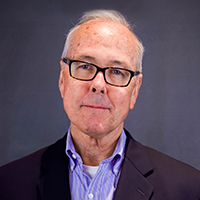 Allowable design is currently the predominate design procedure in Florida. A #7 bar is the largest bar that I personally recommend for 8” masonry. The designer was hopefully thinking that the walls would be built first before creating this detail. As you are well aware the installation of the block is not the problem although a 3/4" space at the top would be more realistic and wouldn't effect the structural support of the wall by the very healthy 4x4x3/8 angles. If the engineer felt the need you could easily increase the number of anchors on each side from 2 to 3 to compensate for the additional moment from the wall. But that only addresses the installation of the masonry unit itself. The next problem is the installation of the grout which cannot be squirted into a 1/2" crack at the top of the wall. A common way to grout masonry walls under an existing slab is to core a 3" or 4" hole in the slab at 4' or so along the wall and grout the wall through those holes. It does sound like the engineer would like the top course grouted to increase the lateral load resistance. Failing being able to grout the top course through the cover slab you could engage some exotic method of porting and pumping a very fine grout mixture (it wouldn't meet C-476 but would work) into the wall at a lower level. The vertical steel is the easiest and you have probably done this many times. Just create a hand hold in the wall and slide a lapped bar up into the top course after it is laid in place. The horz steel as detailed is virtually impossible to install as you already know. This steel can only serve two purposes: 1) to span the 6' 8" laterally between the 4x4 side plants and 2) to provide horz reinforcement for crack control. The crack control reinforcement would actually perform better in the next course down ( or 3 or 4 courses down - makes no difference). Concern about the wall spanning laterally 6' 8" could be addressed by simply reducing the steel size to a #3 bar which could be slid into a hand hole in the top course. Another solution would be to distribute your latter supporting 4x4 angles down the length of the wall rather and a single 18" long piece at 8' o/c. Say... something like a 4x4x4" lg piece at 2' o/c. Your lateral bending between the supports then becomes insignificant and your (2) #5 bars in the second course down would take care of your crack control slightly more efficiently then if they were in the top course. Other than that you can form and pour the top course which still doesn't address how you get the concrete into it. I am honestly surprised that the engineer of record would not immediately recognize that he had created an extremely difficult (impossible) detail to construct and be helpful in rectifying the situation. If it has not already been done I would recommend providing him with the opportunity to come up with a reasonable engineering solution to the problem. Perhaps he has not been informed of the problem? ​What is the contractor's responsibility in specifying the strength of concrete? For example, would 2,500 PSI High Strength achieve the wind loads and 20ft wall heights? Or would 3,000 PSI CMU be needed for 20’ walls grouted 8” o.c.? That is why you hire a structural engineer! It depends... on the location, height of the wall section, vertical load, fixity of end conditions, openings, lateral support, etc. You're not designing the wall section, simply offering advice on the availability and cost of materials along with potential problems with the use of various materials. Without designing the wall section myself - which would include understanding the entire structure that the wall is a part of - it isn't possible to challenge or advise him on the design. How do you make a residential bond beam? What is a typical Florida bond beam and how is it built? Florida masonry bond beams are usually 1 or two courses of bond beam block grouted solid. Bond beam block differs from regular block in that the center webs are cut down to receive horizontal steel. One course bond beams must be tied down at a closer spacing than 2 course bond beams because they don't have as much strength. The masonry industry recommends the two course bond beam for several reasons: Larger allowable spacing between vertical tie downs and a longer embedment length for vertical tie down bars are the main structural reasons. Cost wise there is not much difference between the one and two course bond beams, especially when bars are only called for in the top course. The mason can lay his block all the way to the top of the wall without stopping. He simply puts in his grout stop under the second course then finishes laying his wall up and places his steel in the top. The second course can be built out of regular block so the only additional cost is about a cubic yard for grout for a typical 2000 sf home. The steel is more effective in the top of the bond beam because of the uplift forces on the roof from wind. 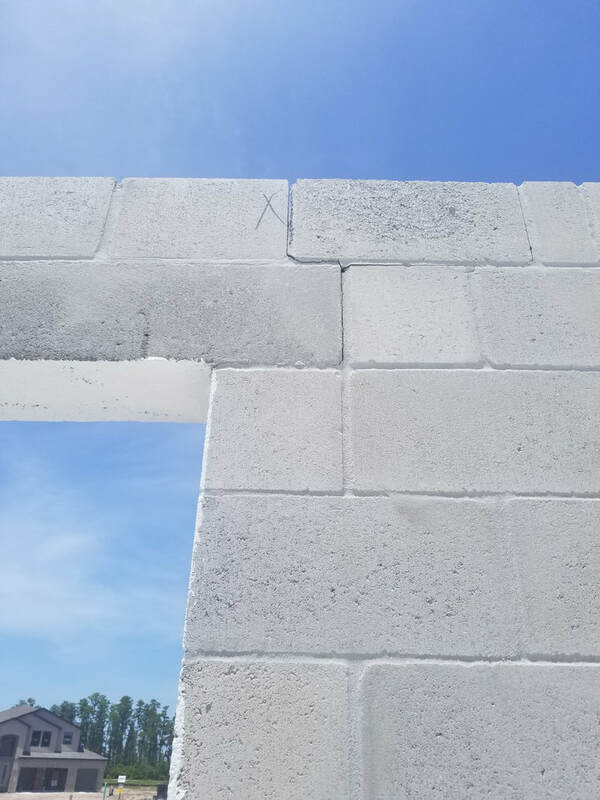 To summarize, the most common bond beam used in Florida and the bond beam recommended by the masonry industry is a 2 course solid grouted bond beam with a single bar in the top course. The top course would be bond beam block and the second course would by regular block. Vertical wall steel should hook into the top of the bond beam. The spacing of vertical wall steel will vary depending on your height of wall, span of roof and wind speed. ICC 600 gives specific instruction all of these issues and is accepted by the current 6th Ed, 2017 Florida Building Code, Residential. The architect is specifying the product DRY-BLOCK by gcp applied technologies as an integral waterproofing admix to be added to the block that are to be covered with a direct applied stucco. Is this what the industry would recommend? 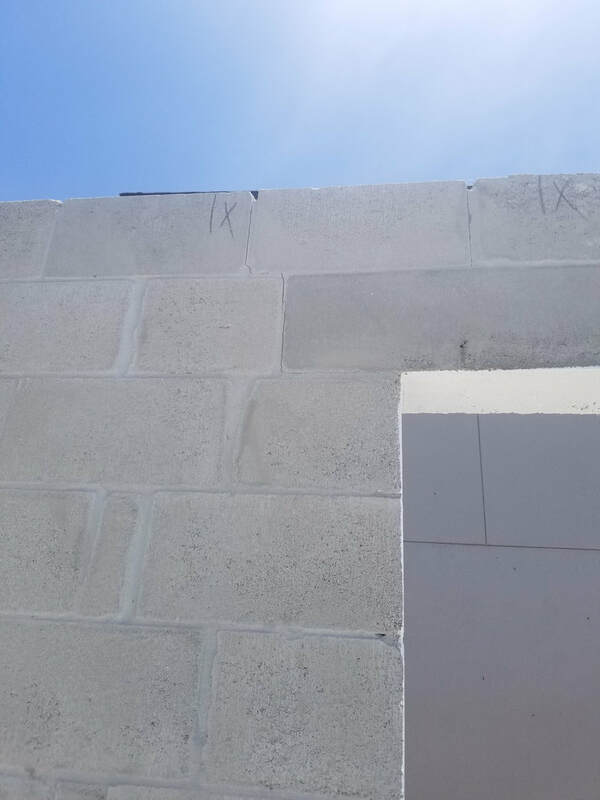 The masonry industry and the stucco manufactures in Florida clearly DO NOT recommend the use of an integral waterproofing agent in masonry to be covered with direct applied stucco. This is not specific to the DRY-BLOCK product but applies to ANY integral waterproofing agent added to the block during the manufacturing process. The reason is simple - integral waterproofing agents negatively effect the bond between the block unit and the stucco coating. This bond is one of the most important aspects direct applied stucco coatings. The problem is that good stucco bond depends on absorption of cement and water, out of the stucco, into the pores of the block. The integral waterproofing agents are an excellent product for preventing exactly this type of water movement. Integral waterproofing in the masonry is highly recommended for single-wythe masonry walls which are not covered with direct applied stucco. They would also be appropriate for masonry covered with stucco attached to lath that is then mechanically attached to the block. In the case of direct applied stucco, the stucco itself is the primary waterproofing barrier protecting the wall. Stucco has proven itself an effective waterproofing barrier by both experience and testing. Safety Videos Availability or location? We have a customer that is looking for a video on jobsite safety and best practices in masonry construction. Can any of you guide me to this? The Masonry Contractors Association of America www.masoncontractors.org has the best selection of job site safety videos and training.